Lasting change won't happen until you take that first step toward a strategy that works. 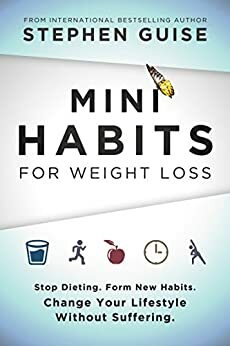 Similar books to Mini Habits for Weight Loss: Stop Dieting. Form New Habits. Change Your Lifestyle Without Suffering. Stephen Guise is driven by his desire to find the most effective behavior change strategies. To help others maximize their potential, he has developed an array of unconventional, result-driven ideas. In particular, his ideas of extreme willpower conservation, no-motivation-required action plans, multiple-cue habit formation, success-cycling, and "stupid small" steps form the unique foundation of Mini Habits, which is being published in more than a dozen languages. There are weight loss concepts here that are fresh and simple - although they may take some time to master. I particularly love the connection to a sense of autonomy or shame around food. I appreciate the simple deconstruction of these concepts as they relate to food. I also had a 'duh' moment when the author mentioned how the body does not like the shock of sudden dietary restriction (ie going on a diet)... brilliant! So obvious but I never made that 'shock/threat' connection, knowing full well about famine response etc.. Simply and succinctly put. There is a lot here to process, but it quality not quantity, and it is worth the investment . Finally some common sense, with some scientific data to back it up, in an approach to weight loss. This book dismisses all the fad diets and trends and gives the reader the tools they need to move forward on this journey. This book filled a gap in my living skill-set that is now so important to me I don't know how I haven't found anything like it before. From the start it was so inspiring I chose to read it slowly, knowing it would deliver. Thank you, Stephen. Have you ever eaten a decadent slice of cheesecake, only to finish and think, "Man, I could really go for some vegetables right about now"? If not, let me introduce you to Stephen Guise and the concept of mini habits. The idea, as conceptualized in this book, is not to take an approach of deprivation and radical change, but to make small, incremental, consistent changes that ultimately result in a permanent, healthy lifestyle. Stephen (can I call him Stephen?) is upfront from the beginning: this is not a journey of quick fixes, rapid weight loss, and cleanse diets. This is about working with the brain's natural resistance to change by fooling it into thinking you're not asking much from it. And really, you're not. If your goal is to do one push-up a day, you will find yourself down on the ground much faster than if your goal is to do 20. And once you are down there, you will do some more. It's human nature. The hard part, the decision to do a thing, is over at that point. And even on your worst day, even if you really only can do one, you've still made some forward momentum and reinforced that daily habit. I only finished this book a couple of weeks ago, but I have already seen the changes happen. The most brilliant stroke was in never making a food craving off limits, no matter how ridiculously unhealthy. Instead, he encourages a movement toward healthy food, a letting go of the binary way we think about eating (''I'm going to eat healthy'' vs ''I'm going to eat badly.'') As he says in his book, you know what's better than three slices of pizza? Three slices of a pizza and a salad. It's pithy and funny, but there is much wisdom here. When we're at a party, we don't have to decide between carrots and cookies. We can have both. And that realization is the spark of something rather profound. The more whole foods you eat, the more you incorporate them into your daily life, the more you want them for their own sake, not because you should eat better, or because you are desperate to lose weight, but because they are tasty and make you feel good. My nutrition mini habit, one recommended by Stephen, is to make one healthy food upgrade a day. That means a banana with breakfast, or a vegetable with lunch, or water instead of soda for a meal... just one healthy change from the norm. What I've found, as Stephen predicted, is most days I do far more than that. Some days I find myself concocting entire meals from scratch, just because I would rather eat that. But even on my worst days, I can make that one change and feel like I have forward momentum. Thus I have found myself eating fresh vegetables alongside leftover pizza, and a red bell pepper after I finished my cheesecake. What's remarkably different from previous attempts to shift to a healthy lifestyle is that for the first time ever, it feels like a choice. Not some hard-nosed restriction I'm trying to impose on myself for my own good, but just making choices amidst the ebb and flow of everyday life (the fact that my other mini habit is sitting down on my meditation cushion before bed doesn't hurt... I am much more mindful of my eating habits based on increased meditation alone.) Even my fast food addiction is waning, not because I've forbidden it, but because I've noted that fast food generally makes me feel like crap. I'm saving my sweet tooth for higher quality desserts, stuff I really love. I'm no longer eating with an attitude of scarcity - I shouldn't be having this, I must eat it now because I can't have it later. When there is no famine, there is never any need for feast. I ate out at three restaurants this weekend, and not once did I overeat or feel guilty about my choices. It's the difference between "What's one small thing I can do to make this healthier?" and "Screw it, I'm going to eat all the things." When you're working within a more reasonable framework, when you stop with all or nothing thinking, you make more healthy choices than you would imagine, and you don't have to fight your lazy brain to do it. 498 people found this helpful. 5.0 out of 5 starsThis book can simply change your life. This is not just another a dieting book. it does not have recipes. It does not tell you to eliminate this or that from your diet. None of that crap. None of the usual 'you need to motivate yourself' hype. This book can simply change your life. I know - I've been dieting all my life and got nowhere, but can see how the strategies described in this book can change it forever. I'm a big fan of Stephen Guise's Mini Habit strategy to habit formation. And here he has written another book that can help people get healthier, slimmer, happier in a simplest, easiest to implement and successful way. 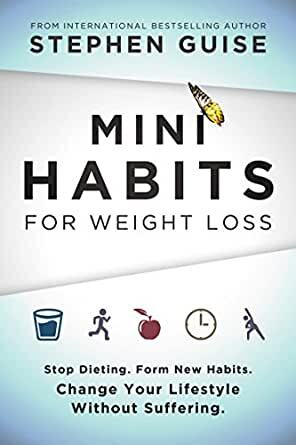 The author applies his famous Mini Habits principles to eating habits, bypassing completely the ineffective, hyped-up mainstream dieting strategies, showing why they don;t and can't work. Diets make us fat. If we really want to lose weight, he argues, our goal should not be losing weight, but changing our behaviour And this is achievable through changing our habits, because consistency is the key to lasting behavioural change. Stephen present scientific evidence to support his claims. He also gives multiple examples of effective strategies. Do you know there are 8 ways in which you can stop drinking soda drinks? Out of them, only 1 is really about forcing yourself to stop drinking it outright. The remaining 7 are much more realistic and 'user friendly', and therefore more likely to be adhered to and - consistent! I like when he debunks some oof my 'pet hates' dieting myths of 'healthier option a.k.a. a smoothie' or a diet foods and drinks, low-fat dairy, the 'I deserve it' trick (one of my weakest points, I admit). he also gives plenty of strategies for dealing with temptations, cravings, grocery shopping, eating out, etc - and all of it realistic! Stop dieting - change your life and your weight with Mini Habits for weight loss! 227 people found this helpful. 5.0 out of 5 starsHis tone makes all the difference! This book came out at the right time for me. People who are trying to lose weight, myself included, are often stuck in a very negative spiral of thinking about themselves. Guise's tone is so uplifting in this book, which has made a big difference to me from the first page. There is one passage that really stood out to me: "Mainstream motivational theory states that, in order to enact change, one must simply "want it more. "...it's a pity that we're not motivated enough to save our own lives and live better. But wait...the weight loss industry made $64 billion in 2014. When that much money is spent on something, it means public interest is through the thermosphere...people have willingly suffered and paid money trying to lose weight, and they are still being told their desire for change isn't strong enough. That's so wrong it's criminal...People have plenty of desire, they just need a smart strategy that doesn't rely on doing the impossible." Guise is on our side! He gets it. I've never heard something like this said before. I've read other weight loss and self-help books that make you feel less than human; a lot of people just aren't patient or nice to you if you're overweight or depressed. But Guise never talks down to you. He's jovial and friendly. He jokes with you! And his ideas are so well-researched and well-reasoned that you can't help but feel hopeful.